All too often we use the "Superbowl" to describe an event which marks the apex of that particular pursuit. A culmination of hard work paying off in the form of a championship event. "It was the Superbowl of Texas Hold 'em tournaments", or "this chili cookoff is like the Superbowl of all semi-outdoor culinary events". 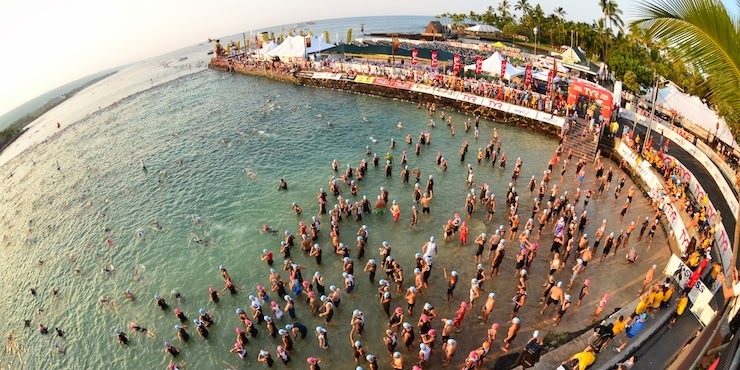 Some people describe the Ironman World Championships in Kona, Hawaii in much the same way. However, I would argue that while it is a "championship" (and pros and top age-groupers treat it that way), for many I have read about it is a celebration of an achievement. The act of getting to Kona was the achievement in and of itself. For the vast majority of the people racing, they had to qualify at a previous Ironman event and place at the top of their age group. The championship race is the capstone to that achievement. The Ironman World Championships are taking place Saturday, October 12, and I would recommend tuning in. I have not had the privilege to have qualified or raced in this event, although I hope to one day, but it seems clear that "celebration" is what this week is all about. And rightfully so! The people that are there have accomplished an extraordinary feat. Not only did these athletes swim 2.4 miles, bike 112 miles, and run a marathon, they did so faster than the vast majority of the other people racing in that event. Their reward? To do it all over again on a more challenging course against some of the best athletes in the world. In addition, many have overcome significant obstacles to get there. I have yet to find as many inspiring stories in other sports as I do with this one. When it comes to the pros, there's a couple examples which demonstrate this. First, was Julie Moss' crawl to the finish in 1982, when her body gave out. Despite having nothing left in the tank and losing her lead, she literally crawled to the finish to complete the race. There was also the "Iron War" between Dave Scott and Mark Allen. Allen had been chasing Scott for many years, but had come up short. In this race their splits were nearly identical, but Allen was able to pull it off with only a few miles left in the race. He then went on to win 5 more World Championships. Allen had adjusted his training style due to his previous performances, and was focusing on developing a strong aerobic base (through heart rate work). This is what allowed his fitness to improve dramatically, and it is one of the main reasons I am using his coaching services through Mark Allen Online. This is not to overshadow the countless stories of inspiration which come from the age group fields. The amount these individuals have to overcome in many cases is extreme - training while having full time jobs, physical challenges and disabilities, and even terminal disease. My descriptions can not do them justice, and there are too many to count, but below are a couple videos. This embodies the spirit of the celebration of the Ironman World Championship. This championship offers amateurs the opportunity to race on the same field as pros. It allows those with the desire to achieve a challenging goal to celebrate their accomplishment with other like-minded people. While in its simplest form it is simply a long distance triathlon, on a grander scale it serves as a platform to inspire people, to challenge people to give the best of themselves and to achieve greatness. It is the fact that this race tends to leave the world a little better than it was before that makes it so great. It is my goal to one day qualify, celebrate, and be a part of the positive energy that exists in Kona at that time. To conclude, I wanted to share a few race reports from age groupers that qualified for the World Championships. They may be a bit long, but they are well worth the read. These are, for all intents and purposes, "normal" people, with jobs, responsibilities, etc. They were able to work really hard and achieve this seemingly insurmountable goal. As a snapshot in time, these individuals are fit, fast, and worthy of the top spot, but leading up to this they had to conquer their own obstacles. If you would like to enjoy any of the coverage of this celebration, tune into www.ironman.com on Saturday, or wait a couple of weeks to see the coverage on NBC. You can also find previous years' coverage by searching Ironman Hawaii on youtube.